In a surprising move, home sales in the Bonaire GA real estate market went up this past month, despite low inventory affecting this market. Some buyers and investors are still finding homes they like but others are moving on to other areas in Houston County for their home needs. Now is the time for homeowners to get their home listed, ensure it is market priced and well maintained, and they will see plenty of consumer traffic coming through their house. As stated over the past few months, it is imperative potential sellers who are considering putting their home up for sale, do so now while the market is in their favor. With 2+ months of available houses to choose from, the amount of available inventory is making it harder to locate properties that meet consumer needs. Is this market good for buyers, sellers or both? Stay tuned for all the details. As a Top Bonaire GA real estate agent, I am showing buyers homes as quickly as they hit the market. However, unless new inventory becomes available soon, this community could continue to see a drop-off in home sales as winter arrives. There is no doubt about it...it is a very good time for existing homeowners to list their house in Bonaire GA. So, what happened last month in the Bonaire real estate market? This review outlines the current status and what the short-term outlook looks like. Let's jump in and see what is going on in this community. As of this article, there are only 112 homes for sale in Bonaire GA. That is 1 more than the previous month. The highest priced listing in this market is currently available at $779K+ and the lowest is $84K+. Square footage of available properties ranges from 1,000 feet to 7,986. Also, there are plenty of properties available in nearly every price point to meet the needs of real estate buyers. Consumers who are looking for a fixer-upper have limited choices as there is currently only 3 distressed houses available in the real estate market in Bonaire GA. Fortunately, the foreclosure/short sale market has remained fairly low this entire past quarter. The highest priced home for sale in Bonaire is a home located at 115 Glenda Drive. Available for $779K+, this 6.2K+ square foot home has 6 bedrooms, 5 bathrooms, and plenty of other amenities to pique buyer interest. Is this the right house for your family? Currently, there are only 25 Bonaire homes waiting to close. This represents an 11 property decrease from the previous month. Of these 25 pending properties, 2 of them are distressed homes. With favorable market conditions at the moment, savvy sellers are making sure their home is ready for buyer viewings, updated as appropriate, and priced according to the current market conditions. While they have the upper hand in this sellers market (2+ months of inventory), homes that are not in good shape will sit on this market. There was a total of 38 home sales in Bonaire GA last month. This represents the eighth highest number of monthly sales in the past year (the annual average is 41 closings). As a comparison, it is 13 sales more than the same time period last year. The average sale price for homes that closed last month was $236K+ and they took an average of 64 days to sell! The 12-month average for both of these categories is $220K+ and 59 days on market. At this time last year the averages were $227K+ and 82 days. The average days on the market was decent but sellers should not get complacent. Listen to your agent and ensure your home is market priced to give it the best opportunity to get seen and sold. The sales price to list price ratio last month was 99.20%, a slight decrease from the 12-month average of 98.86%. The most expensive sale in Bonaire real estate last month sold for $450K. The lowest priced sale came in at $90K. In addition, zero of the closings this past month were distressed homes. What Can Bonaire GA Residents Expect In The Coming Months? You can expect plenty of buyer competition when you are ready to make an offer on a property you like. There are a lot of consumers out looking for homes and this community is where many start their search. Be prepared for a bidding war if you are not ready to write an offer as soon as you decide the house is what you have been looking for. Any delay could cost you the home! Like all markets in Houston County, an influx of new inventory would continue to keep buyer interest at a high level. More importantly, it would keep those consumers looking in Bonaire GA and not elsewhere in middle GA for their dream home. Check out the latest details and find the right market for your needs. Happy middle GA house hunting! 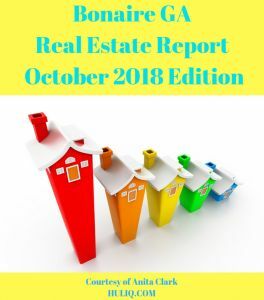 This Bonaire GA real estate market report was provided by Anita Clark. Anita is a licensed residential real estate agent in Bonaire GA. She works at Coldwell Banker SSK, Realtors. You can find Anita on numerous social media networks or via her Bonaire GA Real Estate Blog. She is an active online real estate marketer who loves helping residential real estate consumers in Houston County GA.